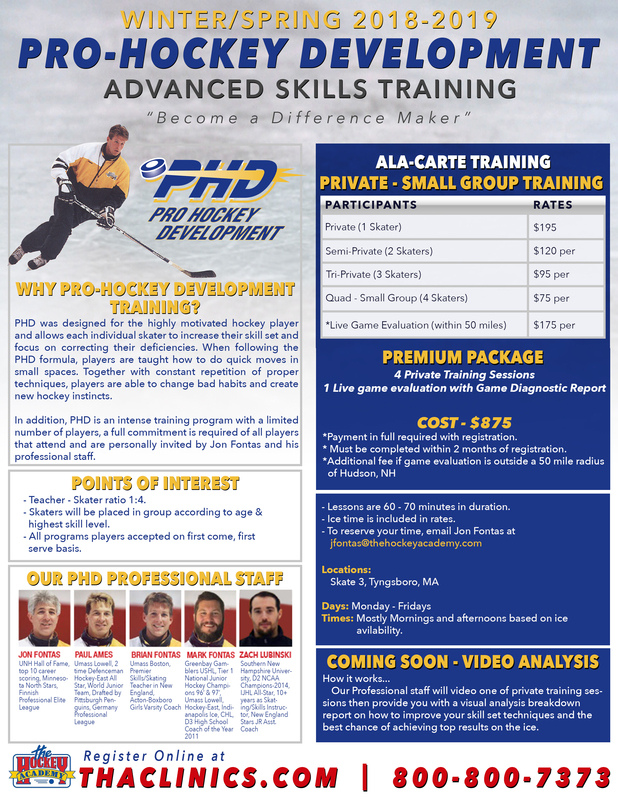 PHD was designed for the highly motivated hockey player and allows each individual skater to increase their skill set and focus on correcting their deficiencies. When following the PHD formula, players are taught how to do quick moves in small spaces. Together with constant repetition of proper techniques, players are able to change bad habits and create new hockey instincts. In addition PHD is an intense training program with a limited number of players, a full commitment is required of all players that attend and are personally invited by Jon Fontas and his professional Staff. UNH Hall of Fame, top 10 career scoring, Minnesota North Stars, Finnish Professional Elite League. Umass Lowell, 2 time Defenseman Hockey East All-Star. World Junior Team, Drafted by Pittsburg Penguins. Germany Professional League. Umass Boston, Premier Skills / Skating Teacher in New England. Acton-Boxboro Girls Varsity Coach.